ORIGINATING in Europe, the global trend is towards simple, clean and clear FMCG packaging, with colour, design and material structure playing a huge role in ensuring on-shelf appeal. Acquiring the services of a specialist packaging company to interpret exciting ideas and turn them into practical containers is imperative, so when two leading brand owners were looking for up-to-the-minute packaging for their respective cereal brands they turned to Blackie and Associates to deliver the goods. Over the years, Tiger Brands has developed a family of products under the Ace brand name, including Samp, Maize Rice, Cream of Maize and, most recently, Ace Instant Porridge. Joining this growing brood is Ace Quick Cook Maize. The product is aimed at the modern urban generation of maize meal lovers. ‘Without losing that well-loved Ace Taste, consumers can now enjoy their favourite maize meal in a matter of minutes. 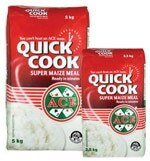 Ace Quick Cook Super Maize meal is a smooth white maize meal, combining the great taste and nutrition of regular Ace Super Maize meal,’ says brand owner Tiger Brands. remarks Dave Cousins, marketing executive at Tiger Brands: ‘To introduce our latest addition, we were looking for packaging that would stand out on-shelf and differentiate it from competitors. ‘As Blackie and Associates currently supplies Ace Instant Porridge bags, it was the logical choice for the project,’ adds Sunil Beni, packaging development manager for Tiger Brands. Hugo Oosthuizen, technical manager at Blackie and Associates, picks up the story: ‘Tiger Brands briefed us to develop a high-gloss paper bag that exceeds the glossy look currently enjoyed on Ace Instant Porridge bags,’ he explains. ‘Finding a solution for the appearance was not difficult but the bigger challenge was to improve aesthetics while maintaining efficiency on all Tiger Brands’ packaging lines at Randfontein Mill. These lines have a variety of tolerances for bag folding before sealing, with different dwell times for each pack size. The material also needed to withstand handling and transportation and be easy for the consumer to open,’ he continues. For the launch of First Choice Foods’ new high-protein low-GI muesli, Fine Form Fit, the design brief was to find the best packaging to preserve delicate fruit flavours, while offering shoppers maximum convenience and appeal. Noel Barry, CEO of Smart Choice Foods, comments: ‘In line with latest trends, we already had our elements for the composition and layout of the packaging design to convey a simple image that clearly communicates the health benefits of our muesli. For consumer convenience, the pouch is fitted with a resealable zip to maintain produce freshness after opening. Blackie and Associates is a small, bespoke importer of flexible packaging materials and ingredients for the FMCG industry. It has a partnership with two factories, one in the Middle East and the other one in Italy, to offer clients innovation, design and realisation.